New online integration tool consolidates booking and travel risk management process for travel management companies [TMC’s] and business travel managers/departments. As part of a significant innovation campaign and concentrate on travel health, security and safety, Serko, and Intelligent Travel immediately announced the launch of these integrated online booking and travel risk management system. This new online system now allows travel management companies to instantaneously evaluate and communicate specific travel threats and hazards, for each person. “Rather than waiting for the activation of workflow or 3rd party services, travel management companies can now integrate the travel administration and logistical facets of business travel using the health, safety, security and risk management elements during the time of enquiry or booking” commented Tony Ridley, CEO at Intelligent Travel when inquired on the innovative new solution. “Some of the benefits include personalized risk assessments for every traveller, integrated administrative and risk management services via their chosen TMC [travel management company] in addition to significant cost efficiencies by giving payment at point of sale instead of annual subscriptions that are notoriously underutilized by businesses” he proceeded to describe. While the announcement from the new, seamless connectivity between travel administration and risk management is a significant advancement, both companies emphasized a number of additional enhanced features available through this new approach. 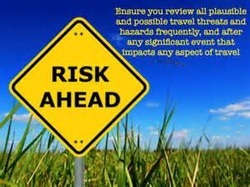 The threats relative to every individual traveller are matched against their personal travel itinerary, which in turn creates their own unique travel risk rating/evaluation and provides them a number of information, education, news and support resources specific for their destination. These resources include reports, briefings, videos, tips, related links and continued travel and risk news on their whole of journey activity. Content includes updates on hotels, traffic, airports, local events, tourist activities along with a growing set of additional destination and activity related resources. “We assist TMCs to lessen the duplication of infrastructure and costs which have traditionally been passed on the business users” noted Tony Ridley. “Together, with this particular integrated approach, businesses and travellers use a single point of reference for all their travel administration, health, safety, security and risk management requirements which even has a flow on effect for procurements as they are now able to consolidate providers and services through a single channel, the TMC” he concluded. This new online booking and travel risk management method is available through the Serko Online network of resellers and travel management companies. Serko Online connects towards the Intelligent Travel system via direct API connectivity. At pos, Serko Online incorporates Intelligent Travel’s destination information towards the travel booker by associating relevant content to itinerary items. Serko Online’s policy and workflow functionality is then placed on Intelligent Travel’s content, allowing designated risky destinations to draw different rules and workflow to designated low risk destinations, configurable right down to the precise traveler level if needed. On submission with the booking, Serko Online will generate Intelligent Travel content to the TMC for end to get rid of data management.